Wales forward Gareth Bale has returned to training at Real Madrid and is being lined-up for a return in the Champions League on 8 March. 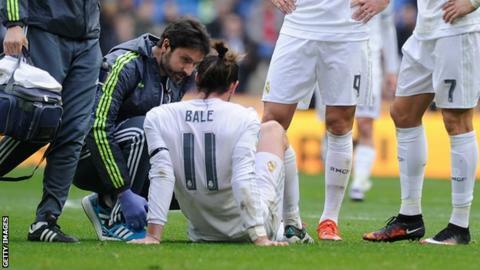 Bale injured his calf against Sporting Gijon on 17 January, but the world's most expensive player is now ready to return after 44-days out. Madrid coach Zinedine Zidane confirmed the news and underlined Bale's importance. "He [Bale] is a fundamental player for Madrid," Zidane told the Real website. "Of course I would prefer to have him with us. "Gareth was with us this morning. It is his first full training session. It went well, he did not feel the problem he had. So I am happy with that, his problem is over. "It is more difficult then to pick the team, but I always want Gareth with us. We will see if he can be back with us this weekend." Madrid face Celta Vigo in La Liga action on Saturday, 5 March before entertaining AS Roma in the Champions League on Tuesday, 8 March looking to protect a 2-0 advantage.